Design Methods is an engineering firm that provides multidisciplinary engineering consulting and design services. It was created by Ubaldo Cella in 2012 with the aim to support industries and design teams with high specialized competences on aerodynamic design, CAE analysis, software development, CAD modelling, numerical optimization environment and customized design tools development. Ubaldo Cella was born in Messina (Italy) in 1969. He graduated in Aerospace Engineering at the “Politecnico di Milano” in Italy and obtained the PhD degree at the university of Rome “Tor Vergata”. He began working in the aeronautical field in 1997 at the Department of Aerospace Engineering at the Royal Institute of Technology (KTH) in Stockholm (Sweden) where he attended the “Master’s project in Aeronautical Engineering” (addressed on aerodynamics); the research, funded by Saab Aircraft, had as object the validation of CFD (Computational Fluid Dynamic) codes and the development of a post processing software. Back in Italy, he worked for two years in the Automotive sector dealing with turbomachinery design and preliminary design software development. In 2001 he returned to work in the aerospace field with the responsibility for Piaggio Aerospace of a research project concerning the development of a NLF (Natural Laminar Flow) transonic wing. The work was carried out at the Italian Aerospace Research Centre (CIRA). The success of the project was certified, after four years of development, by three weeks of experimental tests in the DNW–HST transonic wind tunnel in Amsterdam. This work gave him the opportunity to acquire a significant expertise in aerodynamic laminar design. 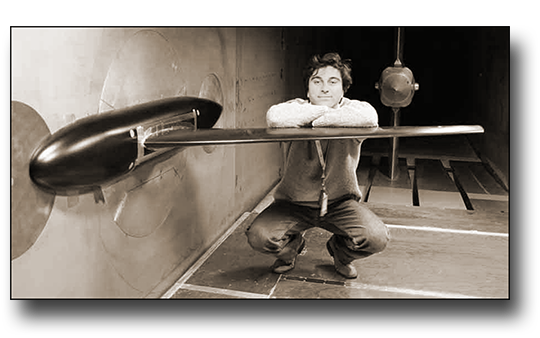 During the following five years he was responsible for the aerodynamic research at Piaggio Aerospace. He joined several international research projects in collaboration with leading European aircraft companies, universities and research centers. He was involved in the aerodynamic design of new aircrafts and was responsible for methodologies and design tools development, mainly based on multidisciplinary numerical optimization environments. He loves sailing and studied Yacht Design by himself and by attending short courses and seminars at several European universities. In 2010 he began working as an independent consultant and in 2012 he created Design Methods.